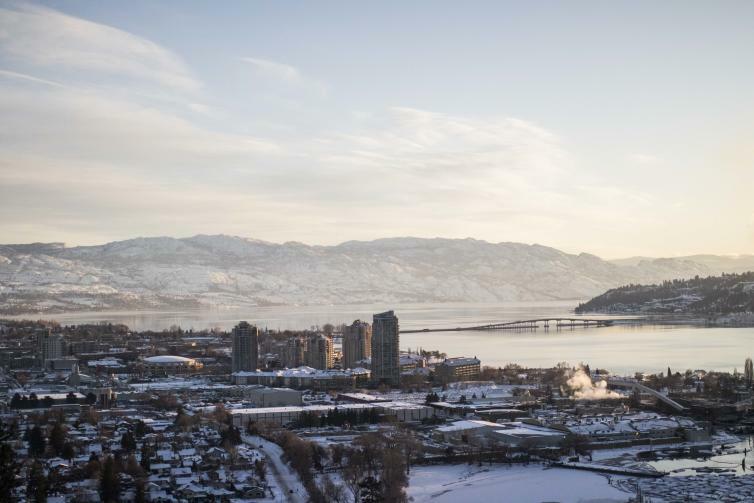 Grab your toque, mittens, some extra layers, and bring your camera because some of the most beautiful scenic photos are taken when the snow blankets our local hills and mountains. 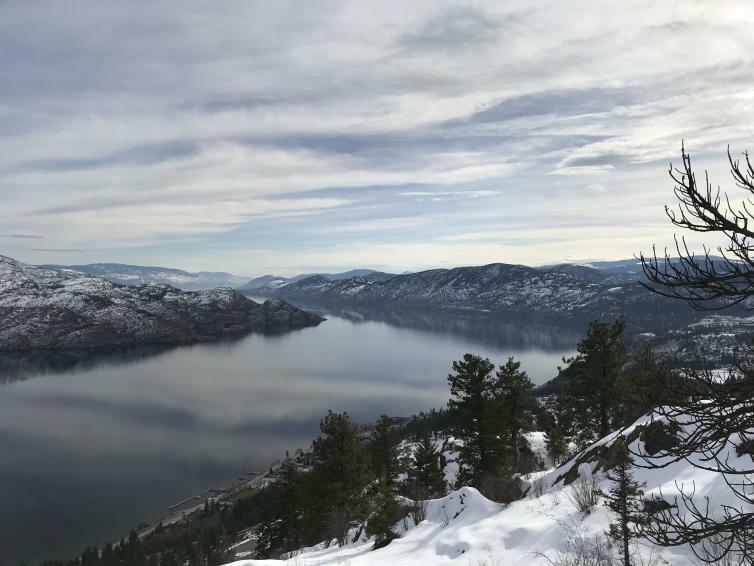 Here are a few suggestions on where to hike to capture some of the best winter views of the Kelowna area. 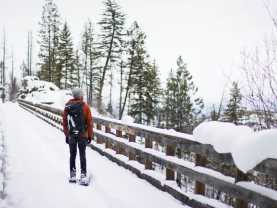 Depending on how much snow is on the ground, you might want to consider packing a pair of snowshoes for your journey. Take in the panoramic vistas of the valley at the peak of Knox Mountain Park! It does take a bit of time to get to the top as you have to climb 300m above the water to get to the summit, so make sure you are dressed appropriately and remember to pack some water with you before you begin your trek. Also, keep in mind you will likely warm up on the hike up. Because the main road to the top is closed to vehicle traffic in the winter season, the road closure makes for a wide and gradual uphill walking surface. 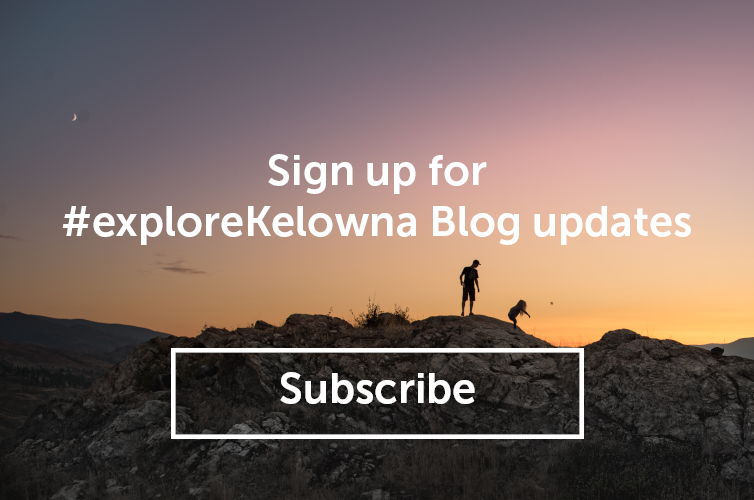 Part of the iconic Kettle Valley Railway is located in Myra Bellevue Provincial Park and is known for its historic trestles and tunnels. 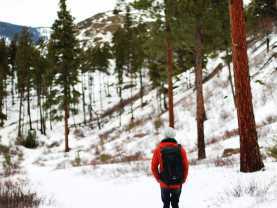 Depending on the winter road conditions, snow tires and an all-terrain vehicle may be necessary to get to the trailhead, but once you arrive, this is an easy and flat hike as it was once an old railway and there are no elevation changes. If you are planning to see all 18 trestles, give your yourself plenty of daylight hours as the trail is 12km long (one-way). There are two entrances to the park, and we recommend heading to the Myra Station Parking Lot Entrance that can be accessed via the Myra Forest Service Road from McCulloch Road. The drive is 8km once you’re on the service road. 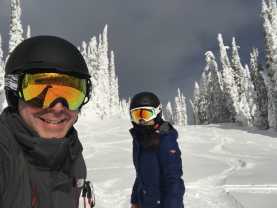 Only about 15 minutes from Downtown Kelowna is Mount Boucherie in West Kelowna. 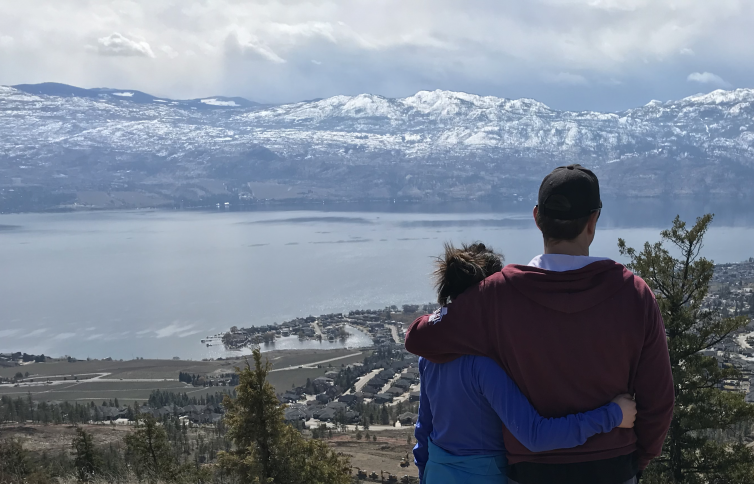 With options for both an easy hike and a more difficult trail, all abilities of hikers can check out this great park that boasts 360-degree views from the top. For those who are looking for the steeper route, the Boucherie Rush is a 3km path that gains 274m from the bottom to the top. The trailhead for this option is off of East Boundary Road. A beginner and kid-friendly option with less of an elevation gain can be accessed off of Lakeview Cove Road at Eain Lamont Park. 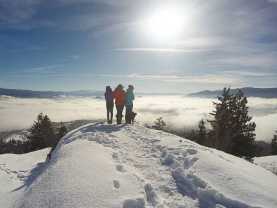 This is an all-season local’s favourite trail in Peachland. Gaining about 250m in elevation from the trailhead to the peak on the 1.8km trail, there are some steep sections on this hike. To get to the parking lot, head to Ponderosa Drive from Hwy 97 and continue until the end of the road. 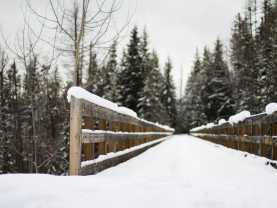 Parking can be limited, but it is likely you will find a spot during the winter season. For the first few minutes of the trail, you will be climbing upstairs but then within ten minutes, you will get to a wider path. Turn right and after a minute or two, look for the trail sign to your left to continue on your way.